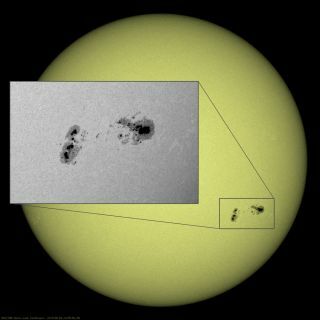 A large cluster of sunspots rotated across the face of the sun in just more than six days, gradually diverging into separate groups. This image was captured on Aug. 26, 2015. In a new video, an enormous cluster of sunspots rotates across the sun's face before gradually separating into several distinct groups, which also fired off a bunch of solar flares. Sunspots are the darker, cooler regions of the sun in the photosphere, the sun's surface layer. Although they appear dark when compared to the brighter, hotter regions around them, they average around 6,400 degrees Fahrenheit (3,500 degrees Celsius). They form via interactions with the sun's magnetic field. The intriguing region in the video produced several medium-size, or M-class, flares, ejecting material from the sun into space. The largest of these was rated as an M-5.6-class flare. The number provides information about the solar flare's strength; higher numbers mean stronger flares. The strongest flare from the cluster erupted on Aug. 24, peaking at 3:33 a.m. EDT (0733 GMT).